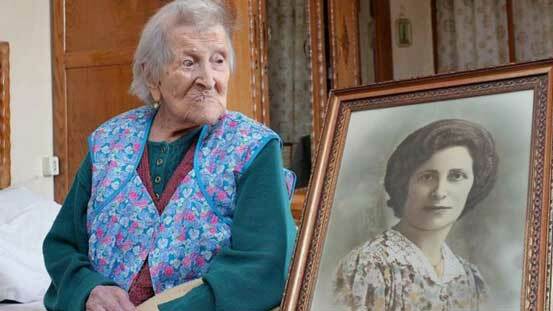 Emma Morano, who at 117 was believed to be the world’s oldest person and the last surviving child of the 19th century, died on Saturday, swearing to the end on her diet of two raw eggs a day. “She reached an incredible finish line,” said Silvia Marchionini, mayor of the town of Verbania in northern Italy where Morano lived on the shores of Lake Maggiore. Morano, who lived 117 years and 137 days, was born on Nov. 29, 1899, four years before the Wright brothers first took to the air. Her life spanned three centuries, two World Wars and more than 90 Italian governments. “My life wasn’t so nice,” she told Reuters last November on her 117th birthday. “I worked in a factory until I was 65, then that was that,” she said as she sat in an armchair by her window, a white shawl over her shoulders. In an interview with La Stampa newspaper five years ago she said her fiance had died in World War One and that she had then been forced to marry a man she did not love. “‘Either you agree to marry me or I will kill you’,” Morano said, recalling his proposal. “I was 26. We got married.” It was not a happy marriage. They had a son in 1937, but the baby died after just six months and the following year Morano kicked out her abusive husband. “I separated from him in 1938. I think I was one of the first in Italy to do that.” Morano outlived all her eight brothers and sisters, including one who died at 102. She thrived on an unorthodox, unbalanced diet. “When I first knew her she used to eat three eggs a day. Two raw, and one fried. Today she has slowed down a bit, reducing the number to two some days because she says three can be too much,” her doctor, Carlo Bava, said last year. “She has never eaten much fruit or vegetables. Her characteristic is that she always eats the same thing, every day, every week, every month and every year.” Marchionini, the mayor of Verbania, told the Italian news agency AGI that her city has more than 20 people aged over 100.